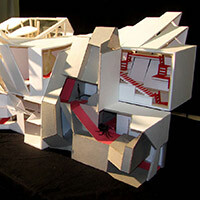 Matias Creimer is a Los Angeles based architecture designer and professor of architecture. He has over 14 years of experience working for architecture design firms including his own studio. He has worked extensively on projects that range from single family homes to billion dollar, mixed-use developments in the US and abroad. This year we picked a site in Downtown LA at the corner of 7th and Brodway surrounded by historical buildings. The new building was meant to serve as the headquarters for the City of Los Angeles Historical Society. There's more than one historical society in Southern California and the idea was to combine them all in a single entity with a stronger urban presence. Borrowing language from roller coasters, the “Architectural Fun Ride” is a block-long, program-less building made up of interlocking segments that are connected by a continuous interior path. Each student was responsible for his/her segment with a goal of ensuring that users would remain motivated to walk through the entire structure. This semester we worked in Downtown LA at the corner of Broadway and 3rd, across the street from the Bradbury Building. The program was a fictitious "Los Angeles School of Arts and Crafts” with some complexity in terms of the different user groups and how they all access and utilize the building. This year's Architectural Fun Ride is a 1/4" scale, 4-story structure made up of interlocking segments designed by different students. Like pieces of a Tetris puzzle, all the pieces have the same size but different shapes. A continuous path runs along the entire structure. The site this year was in the heart of Venice Beach on Winward Avenue This is one of the blocks that once had a continuous colonnade resembling Piazza San Marco in Venice, Italy. Even though most of the block was demolished many decades ago, the "book-end" building at both corners are still standing. This is an extensive remodel of a 1928 cabin in Eagle Rock. All exterior walls were demolished and replaced. Some interior walls were reconfigured to improve the flow of the floor plan. A combination of corrugated zinc and cement board panels was used to clad the exterior walls. Wooden decks on the front and rear yards help to connect the house with the outdoors. This was an extensive 1,500 sf. remodeling job in Los Angeles that included a new sun room, new redwood deck, new kitchen and various upgrades throughout the house. The existing house was from 1947 and the challenge was to integrate the new and the old. 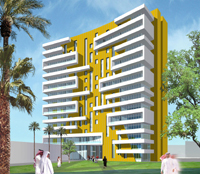 Alraha Gardens is a project I worked on as Project Designer at 5+Design in Hollywood. It is a mixed-use development with retail and entertainment districts, and multi-family housing. It has a total of 1,200 residential units with amenities, parking, theaters and a shopping mall. 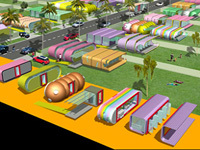 It was conceived as an alternative lifestyle and commercial destination within the Abu Dhabi region. I was in charge of 6 midrise towers (6 to 14 stories). Ensenada, Mexico La Plaza is a project I developed with Eduardo Cespedes and Sergio Zeballos at the Jerde Partnership in Venice, Ca. 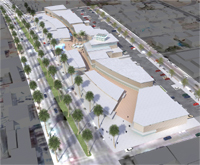 It is a 10,000 m2 retail center with a 4,400 m2 Multiplex cinema located on the Southern end of Ensenada in Baja California, Mexico. It consists of an outdoor retail street and a centralized Plaza with easy parking accessible through the front and back of the property. Mexico City Santa Fe is a mixed use project that I worked on at the Jerde Partnership with Jeff Walker and John Simones. It is a collection of 10 residential towers connected by a podium of retail, parking and residential units facing the opposite side. 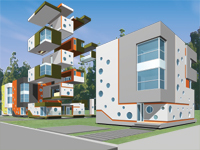 Whole House WHOLE HOUSE is a prefabricated housing system designed to minimize cost and maximize flexibility. The modules are designed to be fully assembled in factory with minimum installation required. The plans are a version of the 'existence minimum' residential housing formula, and the volumes are animated with colors, windows and minor indentations on the facade. Warner Center This is a project I worked on as Project Designer with Mike Walden at Nadel Architects in Los Angeles. It is a residential development with 750 units, parking and amenities. 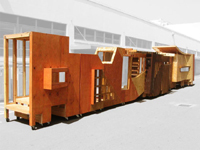 DOCKABLE DWELLING is a factory assembled modular system designed to build houses with minimum on-site work. It is a modular kit of parts based on NASA’s approach to space station modular docking. Variation is achieved through different combinations of a limited but expandable amount of modules types. This is a design/ build class that I taught at PCC to 24 students working in groups of 3. Each group was expected to design a segment of a larger, linear structure. Each segment had to have a wall, a floor, a roof and a window opening. The work was published in JAE in Nov '06 and later in a book by Lukas Freireiss called SPACECRAFT. This is the work produced in a class that I taught at PCC on Materials and Methods. The students were required to work in groups of 3 to design and build a wooden structure that reflected the content of the lectures. I encouraged them to build whatever they wanted but build it according to Type V framing standards. The work was published in JAE in Nov '06. This is a house on Howland Canal, in the historic neighborhood of Abbott Kinney’s “Venice of America". The program is divided in two and arranged in two separate blocks connected by a bridge. This is the second I house I designed for Abramson Architects in the late nineties. It sits on a beach front lot in Newport Beach, CA. This is a house I designed while consulting for Abramson Architects in Culver City. It is an extensive remodel of an older bungalow. The original plan is based on a 9 square grid and we brought natural light to the central module by creating a 2 story atrium with a massive skylight on top. education Paper: “Joint Maneuvers: Diversity as an asset in a Community College exercise”, author. © Matias Creimer 2015. All rights reserved.